Only two specials remain after this one! As nonsensical as this is, there’s still a lot of translation notes to spare. Maybe even more than the list of notes I had to make for the batch release of Little Busters! I have to say that most of these puns are really dumb but I guess it’s good enough for a laugh. So this pun requires two screenshots and three dishes to explain. First of all, for pork soup (豚汁, tonjiru), sliced pieces of pork are essential for the meal. 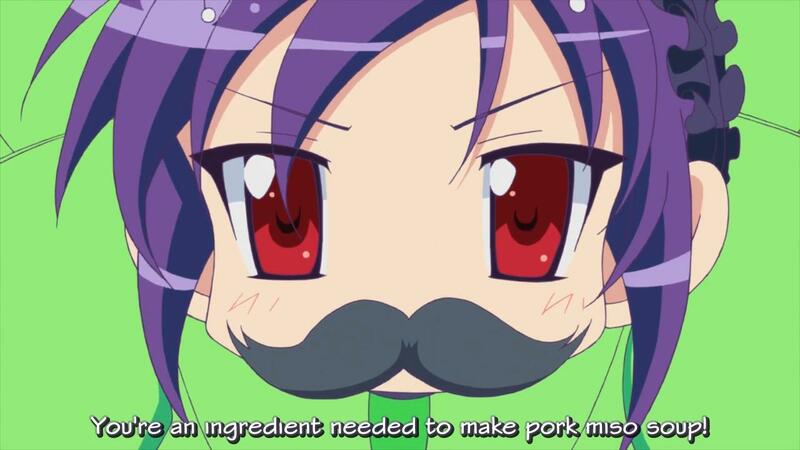 Therefore Haruyuki could be needed for preparing that meal, with a sense of cannibalism here because he’s in this avatar of a pig. This cannibalistic joke is continued in the next screenshot, where we get to know tom-yum-koong, a spicy clear soup based in Thailand, and samgyetang, a ginseng chicken soup based in Korea. 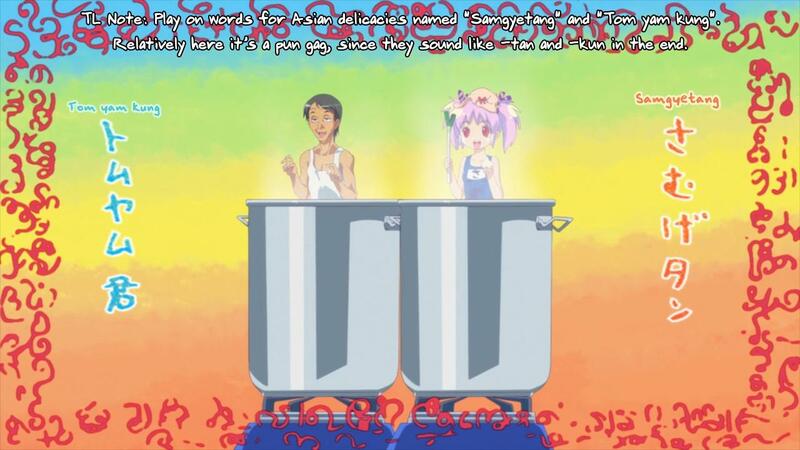 In Japanese, “kun” and “tan” are both honorific suffixes for addressing people, so Tomyam-kun and Samuge-tan are pictured as people being cooked in a soup in the same sense as the previous joke. The translation note actually already says what I’m trying to say, so I can just copy and paste what it says. 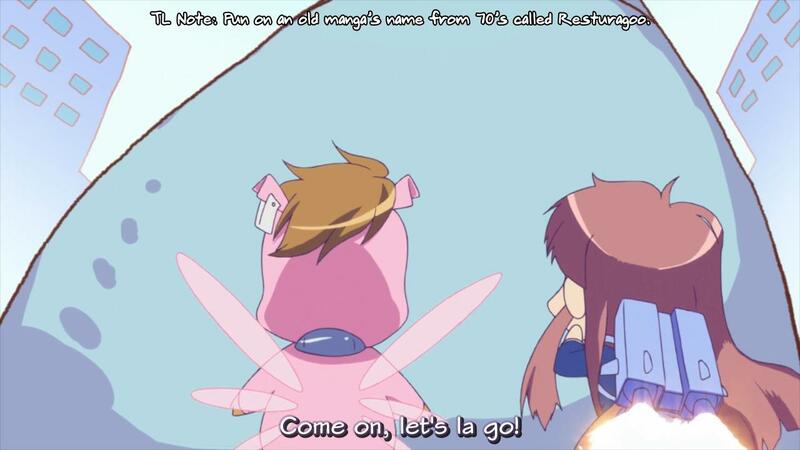 She adds a “la” in the Let’s go!, which is apparently a reference to an old manga’s name from the seventies called レッツラゴー (rettsuragoo). Seems it got typoed in the screenshot. 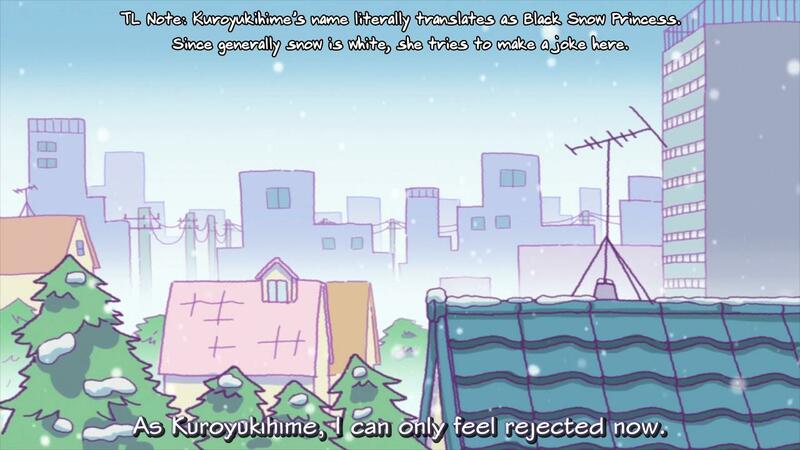 Kuroyukihime(黒雪姫) literally translates as Black Snow Princess, but maybe a better wording might be the opposite of Snow White(白雪姫), in other words, Snow Black. As it was pure white outside due to the snow, she feels like she’s being rejected by the gods. I guess it’s a joke… but it feels like plain obvious if you ask me.